"Guest Column: A (Texas) Liberal in a Red State" was first published by The Texas Tribune, a nonprofit, nonpartisan media organization that informs Texans — and engages with them — about public policy, politics, government and statewide issues. Since her filibuster on June 25, activists, politicians and pundits within and outside of Texas have been discussing a possible 2014 gubernatorial bid by state Sen. Wendy Davis, D-Fort Worth. However, beyond her pivotal role in temporarily derailing a strict omnibus anti-abortion bill and her compelling life story, most Texans, let alone most Americans, know little about Davis. An analysis of her voting record on the Senate floor helps partially fill this informational lacuna, highlighting that during her tenure Davis has been one of the Texas Senate’s most liberal members. Davis assumed office in January of 2009, with a voting record now spanning four and a half years. I use a Bayesian joint scaling methodology developed by Stanford University professor Simon Jackman to locate Davis and her fellow senators on the Liberal-Conservative dimension along which most legislative politics takes place in Austin. Altogether, 2,467 nonlopsided roll-call votes cast between Jan. 13, 2009, and June 25, 2013, are examined. These roll calls encompass Davis’ entire voting record, both before and after her May 2011 filibuster objecting to cuts in education funding first placed her on the statewide radar. A separate analysis suggests that during 2013, Davis drifted slightly toward the ideological middle of the Democratic delegation, perhaps due to calculations regarding her political future. The figure provides each senator’s median ideal point (their Lib-Con Score) and the 95 percent credible interval (CI) for this point estimate. The scores range from the conservative extreme of Sen. Brian Birdwell, R-Granbury, to the liberal extreme of Sen. José Rodríguez, D-El Paso. Only when a senator’s CI does not overlap with that of another senator can we state with some certainty that their respective locations on the spectrum are credibly distinct. In other words, if two senators’ CIs overlap, their positions on the ideological spectrum might be statistically equivalent, even if their scores differ. All senators in office who served during the 2009-11, 2011-13 and 2013-15 (to date) legislative periods were incorporated in the initial analysis. But for our analysis, the chart details the Lib-Con Scores and CIs for the 23 senators who served in all three periods and the eight who served in two of them. Davis has the fourth-most-liberal voting record of the 31 senators. Perhaps of greatest relevance, she is significantly more liberal than four of her Democratic Senate colleagues: John Whitmire of Houston, Juan “Chuy” Hinojosa of McAllen, Carlos Uresti of San Antonio and Eddie Lucio Jr. of Brownsville. By contrast, Davis is significantly more conservative than only one Democrat — Rodríguez. Her ideological position is statistically indistinguishable from that of the other six Democratic senators. During the 2009-13 time frame, Hinojosa, Lucio, Uresti and Whitmire on average represented the centrist wing of the Democratic Party in the Texas Senate, the Democratic analog of the moderate conservative wing of the Republican Party, which consisted of a set of senators ranging from John Carona of Dallas to former Sen. Jeff Wentworth of San Antonio. The roll-call vote data indicate Davis occupies an ideological position notably to the left of this group of four centrist Democrats. And by historic standards, these four hardly fit the mold of the old-school conservative Texas Senate Democrat, arguably the last of whom, Ken Armbrister of Victoria, departed in January of 2007. Paul Burka, Patricia Kilday Hart, Ross Ramsey and others have identified multiple hurdles Davis would face were she to run for governor in 2014. To those I would add one more: Davis would be competing for statewide office in what is still a very red state with the legislative voting record of a relatively liberal Texas Democrat. This record may well prove to be an electoral asset in the future, but in 2014 it would be a liability. Guest Column: A (Texas) Liberal in a Red State By Mark P. Jones July 10, 2013 Since her filibuster on June 25, activists, politicians and pundits within and outside of Texas have been discussing a possible 2014 gubernatorial bid by state Sen. Wendy Davis, D-Fort Worth. However, beyond her pivotal role in temporarily derailing a strict omnibus anti-abortion bill and her compelling life story, most Texans, let alone most Americans, know little about Davis. An analysis of her voting record on the Senate floor helps partially fill this informational lacuna, highlighting that during her tenure Davis has been one of the Texas Senate’s most liberal members. Davis assumed office in January of 2009, with a voting record now spanning four and a half years. 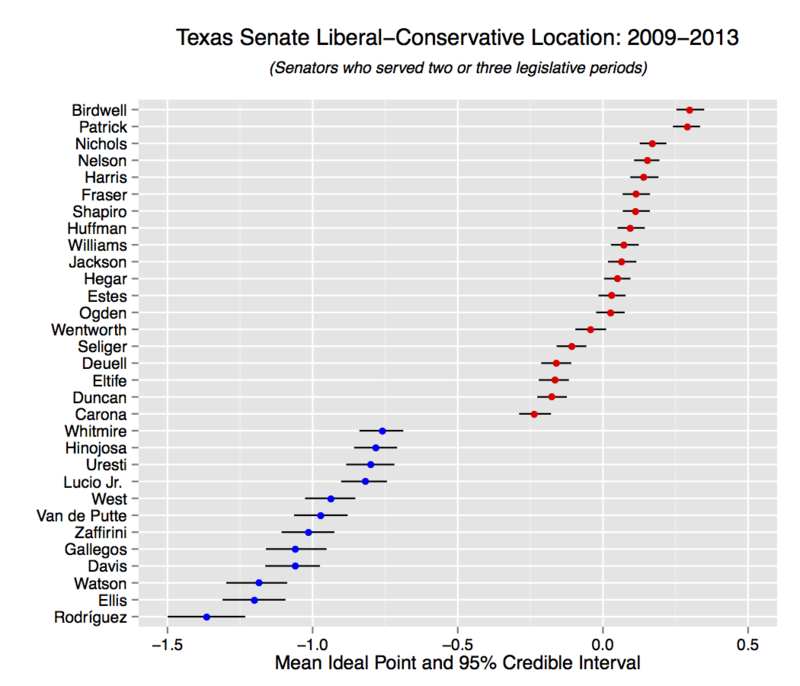 I use a Bayesian joint scaling methodology developed by Stanford University professor Simon Jackman to locate Davis and her fellow senators on the Liberal-Conservative dimension along which most legislative politics takes place in Austin. Altogether, 2,467 nonlopsided roll-call votes cast between Jan. 13, 2009, and June 25, 2013, are examined. These roll calls encompass Davis’ entire voting record, both before and after her May 2011 filibuster objecting to cuts in education funding first placed her on the statewide radar. A separate analysis suggests that during 2013, Davis drifted slightly toward the ideological middle of the Democratic delegation, perhaps due to calculations regarding her political future. Enlarge Mark P. Jones . The figure provides each senator’s median ideal point (their Lib-Con Score) and the 95 percent credible interval (CI) for this point estimate. The scores range from the conservative extreme of Sen. Brian Birdwell, R-Granbury, to the liberal extreme of Sen. José Rodríguez, D-El Paso. Only when a senator’s CI does not overlap with that of another senator can we state with some certainty that their respective locations on the spectrum are credibly distinct. In other words, if two senators’ CIs overlap, their positions on the ideological spectrum might be statistically equivalent, even if their scores differ. All senators in office who served during the 2009-11, 2011-13 and 2013-15 (to date) legislative periods were incorporated in the initial analysis. But for our analysis, the chart details the Lib-Con Scores and CIs for the 23 senators who served in all three periods and the eight who served in two of them. Davis has the fourth-most-liberal voting record of the 31 senators. Perhaps of greatest relevance, she is significantly more liberal than four of her Democratic Senate colleagues: John Whitmire of Houston, Juan “Chuy” Hinojosa of McAllen, Carlos Uresti of San Antonio and Eddie Lucio Jr. of Brownsville. By contrast, Davis is significantly more conservative than only one Democrat — Rodríguez. Her ideological position is statistically indistinguishable from that of the other six Democratic senators. During the 2009-13 time frame, Hinojosa, Lucio, Uresti and Whitmire on average represented the centrist wing of the Democratic Party in the Texas Senate, the Democratic analog of the moderate conservative wing of the Republican Party, which consisted of a set of senators ranging from John Carona of Dallas to former Sen. Jeff Wentworth of San Antonio. The roll-call vote data indicate Davis occupies an ideological position notably to the left of this group of four centrist Democrats. And by historic standards, these four hardly fit the mold of the old-school conservative Texas Senate Democrat, arguably the last of whom, Ken Armbrister of Victoria, departed in January of 2007. Paul Burka, Patricia Kilday Hart, Ross Ramsey and others have identified multiple hurdles Davis would face were she to run for governor in 2014. To those I would add one more: Davis would be competing for statewide office in what is still a very red state with the legislative voting record of a relatively liberal Texas Democrat. This record may well prove to be an electoral asset in the future, but in 2014 it would be a liability. Mark P. Jones is the James A. Baker III Institute for Public Policy’s Fellow in Political Science, the Joseph D. Jamail Chair in Latin American Studies and the Chairman of the Department of Political Science at Rice University. Texas Tribune donors or members may be quoted or mentioned in our stories, or may be the subject of them. For a complete list of contributors, click here. "Guest Column: A (Texas) Liberal in a Red State" was first published at by The Texas Tribune, a nonprofit, nonpartisan media organization that informs Texans — and engages with them — about public policy, politics, government and statewide issues. Link back to the original article, which is located at https://www.texastribune.org/2013/07/10/guest-column-texas-liberal-red-state/.